On a cold night in late December last year, I was snuggled up on my couch and catching up on the news. I saw a headline that a freak weather system had caused the North Pole to reach a temperature of 40 degrees, 50 degrees Fahrenheit above normal. I froze (no pun intended). It was warmer on the North Pole than even here in Colorado. Unbelievable … In one article a climate scientist said that if there was ever a call for action to do something about climate change, this was it. I agreed wholeheartedly. But what? I couldn’t sleep that night. The restlessness came from concern for the future of my 4-year-old son. I often read him colorful books about animals from around the world – he loves learning about those animals. Sometimes I read him those stories with a lump in my heart, wondering if many of them would exist very much longer with conditions changing so quickly. So in the middle of that cold, dark night, I felt the one immediate thing I could do was write to my representatives in Congress. I had time on my hands, my favorite pen and a yellow legal pad. I started writing straight from the heart and straight from my fears. Almost as an after thought I wrote one to President Obama, too. Why not ‘eh? I got canned responses via email and snail mail from the representatives. Months went by. Then just last Tuesday I was about to walk into my house when I noticed a large envelope at my doorstep. The return address said “The White House”. I wondered if it was some kind of joke. Inside the envelope was a short letter and someone had scribbled a signature at the bottom. “I can’t even tell who this is from,” I thought! Then I looked, and stared, and looked again, and stared again, “Holy socks on a rooster! This is a personal letter from the President!” It was signed in real ink, and he made references to my original letter. The thought that my chicken scratch on a piece of yellow legal pad paper had made it to the desk of the President brought me to tears. Somebody was listening … And not just anybody, the President of the United States was listening! Maybe Democracy works! Maybe there is some hope for climate change and all the challenges we face. You can bet I will be framing that letter. I certainly can’t stop taking action now. We pull our convoy of vehicles onto the side of the farm plot, our truck bed full of shovels, gloves, and water. “Today, we dig ditch,” Alicia, one of the Arizona FoodCorps members working in Tuba City, Arizona, explains as she lays out the workday. Classic rock blares from a small portable speaker, and we get to digging. The sun beats down on us as we slowly but diligently dig three feet deep along the 300 feet of irrigation ditch, moving over 10,000 pounds of sand and soil in the process. Many farmers only irrigate twice per year, so it is essential that these ditches are clear when they do. Last year, this ditch alone took one committed farmer over two months to clear out. This isn’t your average spring break trip, and these aren’t your average students. 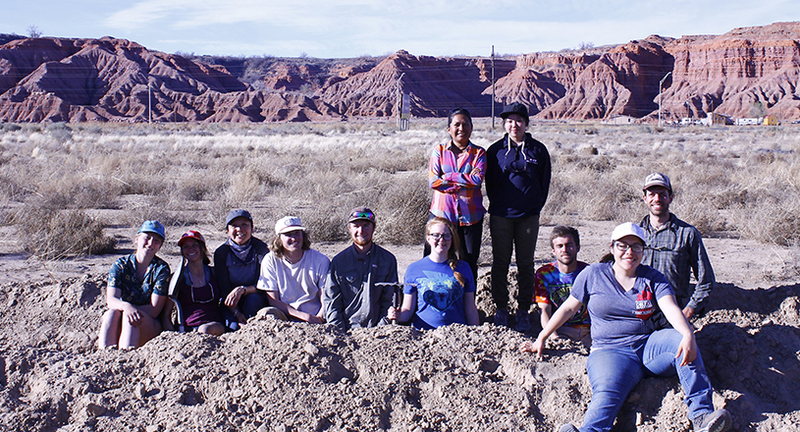 This March, volunteers from Fort Lewis College and Western State Colorado University spent their spring break away from beach umbrellas and volleyball games, and instead dedicated their time to restoring springs on the Vermillion Cliffs, supporting sustainable businesses and energy development on tribal lands, and preserving traditional farming methods. Above: Students from Fort Lewis College in Durango, CO spent their spring break installing solar panels on a home in Hopi and helped support traditional farming methods around Tuba City, Arizona. 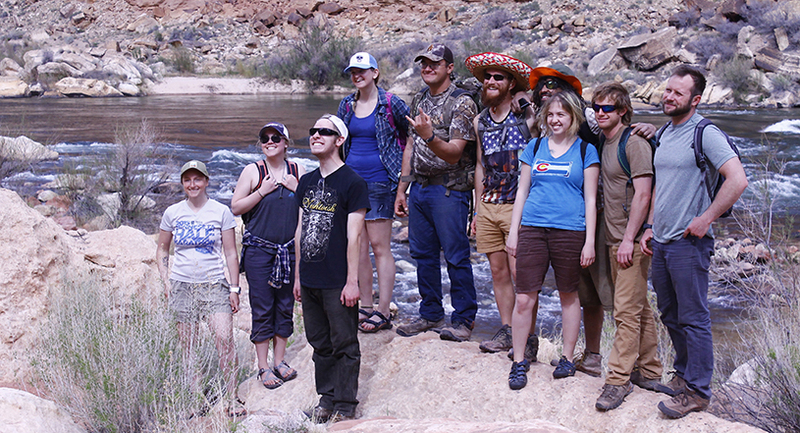 Above: Students from Western State Colorado University in Gunnison, CO worked on restoring springs, removing invasive species, and transplanting native plants in the Vermillion Cliffs National Monument. Each year, young people contribute over 10,000 hours of volunteer work at the Trust on projects that have significant impacts on the social and ecological landscapes of the Colorado Plateau. Students contribute to research, support communities most affected by climate change, and help address the varied legacies of unsustainable development that linger on the plateau. After we finish digging the ditch, we meet up with Leonard Selestewa just downhill of Tuba City, to clear his fields of last year’s corn stalks. Leonard is a traditional Hopi farmer living in Moencopi village, and as we leave his mother’s house, he jokes, “Don’t forget to turn off the light on your way out.” The house has never had electricity. He is doubtful that it ever will. After we finish helping prepare his plots for planting, Leonard takes us around the property, talking about the variable flows in Moencopi Wash as a result of Peabody Coal drawing down the aquifer to slurry coal–coal that provides electricity to Southwestern cities outside of tribal lands. During one violent flood, the lower half of his mother’s property was covered with silt and water. The pick-up truck sticking out of the ground and the water marks six feet up the shed walls stand as proof of the event. Peabody Coal has recently declared bankruptcy. So we ask, what will the legacy of coal be on the landscapes and people it has impacted? How can we act now to support those most affected by unsustainable energy production? How can we work towards a future where wildlife can migrate, flourish, and support the vital ecosystems which in turn support us? If we are to respect the fierce urgency that these issues demand of us, these questions cannot be rhetorical. To the 19 students that joined us on the farms, near the springs, in the washes and mesas of the Colorado Plateau, these questions are founded in real experience and knowledge of consequences. They have learned how watersheds unite us. They have seen how water pumped to slurry coal through the Navajo Nation may dry up vital springs and severely limit the water supply of dry-land farmers, like Leonard, downstream. Our amazing volunteers contributed to one project, but their impact reaches much further than a single farmer who can now plant in time for the rains or the antelope that can now continue migrating because of water in the springs. By helping to sustain ecosystems and cultures, these atypical springbreakers participated in a movement that deeply needs and appreciates their contributions. Join us on a volunteer trip and help us protect and restore the Colorado Plateau! We still have space available for trips this summer and fall. If you are interested in organizing a group trip with us, please apply! Applications are being accepted through September 30, 2016 for the 2017 season. This past Thursday, the FLC Environmental Center was featured in an article in the Navajo Times entitled, “FLC Environmental Center preparing Native Youth”. The article highlights the experiences of two of the EC’s all-stare Dine staff and FLC students, Kelkiana Yazzie (ENVS, 16) and Brandon Francis (ENVS, 15). Additionally, the article was written by FLC Exercise Science senior, Lane Franklin. It is a really great piece and highlights FLC and the EC’s commitment to both support and develop leadership amongst our students, as well as, serve our surrounding region: http://navajotimes.com/edu/flc-environmental-center-preparing-native-youth/. So much gratitude to Lane Franklin for writing up such a moving article…and of course to Kelki and Brandon for the many amazing contributions that they have made at the EC…and will continue to do wherever they end up! The Fort Lewis College (FLC) Environmental Center’s Campus Garden in Durango, Colorado is home not only to organic veggies and herbs, but also to two Local Food Fellows. These dedicated students learn how food systems create environmental and social change….by ultimately building their own. Throughout their time in our garden and greenhouse, our Local Food Fellows discover the in’s and out’s of sustainable food production. They also distribute what they’ve produced to the people who need it the most and ultimately share their newly acquired knowledge through free workshops. In the meantime, our Fellows’ view of the world deepens, they become stronger individuals and engage as committed citizens. Current Fellow, Kelly Ann Maes, believes her work matters because, “securing Local Food in this area is vital to the health and wellness of all community members and youth in particular as they are the future”. This year, our Sow It Forward grant enabled the Local Food Fellows to expand what Fellow, Duke Jackson, loves the most: “creating positive change in our community”. As a result of our revitalized greenhouse and hoop structures, we have extended our growing season and can provide more food and education to individuals in need. Thank you, Kitchen Gardeners International!